Tony’s I-75 restaurant is located in Birch Run, MI. This place is not for the faint of heart. It is not the place to go for a light meal. And it might just be a heart-attack waiting to happen. This establishment will literally put an entire POUND OF BACON on your sandwich. Do you want an omelet? They will put a DOZEN OF EGGS in there. Not kidding. This is a family restaurant that serves up meals of EPIC proportions. They are famous for their serving sizes and they are also famous for the bacon that they serve up here. It is a bacon-lover’s paradise and dream come true here. Did you know that they use up 11,000 lbs of bacon weekly? It is true, read on in my Tony’s I-75 restaurant review! Tony’s I-75 restaurant has been around for nearly seven decades. This place is a Michigan classic. If they had a motto I believe it should be, “go big or go home”. It is a once a year tradition for our family to dine here in the summer. This is not the kind of place you should be going to every week. I wish they included nutrition facts on the menu because the amount of calories here would be off the charts. If you are in a hurry to eat you will often be confronted with a line out the door. Even on a weekday afternoon, there is a line to get in here. The building is not large enough to accommodate the demand. It is a small, cramped restaurant and I wish they would expand to a larger building but they have been at that location for decades and I doubt they are going anywhere. It is worth the wait though and the line does move fairly quickly. Tony’s I-75 restaurant not only serves giant portions of food but they also have a massive menu. They have anything ranging from sandwiches, soups, salad, burgers, subs, dinners, seafood, Italian, and Mexican. And save room for dessert! You can not leave Tony’s without dessert. There is also a decent children’s menu. I highly recommend the kid’s spaghetti with the giant meatball. My daughter ordered chicken strips this year. The portion size for children is very reasonable and they don’t go overboard with kids, which I think is totally cool. Because the menu is so big, I did not capture a photo of every page of it but I tried my best to give you a good idea of what they offer and the prices. Their prices are very reasonable considering the amount you receive. You can view the entire menu online at their website. My BIG meal at Tony’s I-75 restaurant – Antipasto Salad and boy was it ever huge! I often like to go for the seafood here. If you like clams they are jumbo clams. I am talking gargantuan! That is what I typically order but this year I went with the Antipasto Salad. This was my first time ordering a salad here so I wasn’t sure what to expect. When it was brought out my first thought was that it was a beautiful salad. It had all the fixings of an antipasto salad and the portion size was colossal. There was one problem though, my mozzarella cheese was not on my salad. I didn’t realize this at first. It took a few minutes to flag down our waitress but she apologized and was helpful in getting me my cheese. The salad came with a house-made Italian dressing and it was the perfect addition to my plate. The dressing was sensational, and there was excitement in every bite of this salad. I really appreciated the addition of green olives. I never had an antipasto with green olives. You should see the size of my mom’s burrito that she ordered~ MASSIVE! We were all stunned when this burrito came out because I have never in my life seen one this large. Somehow my mom managed to pack half of this in and took the other half home for leftovers. When you dine at Tony’s I-75 restaurant you do often leave with a doggy bag because most meals are impossible to finish for the average person. Joe ordered a pizza sub and the size of that did not disappoint! He tried to take it on and eat the entire the whole thing but he failed! Wondering what was on this monster sub? It came with, ham, pepperoni, mushrooms (Joe left these off), pizza cheese, pizza sauce. And the moment you have been waiting for! Tony’s I-75 banana split! Once a year when we come to Tony’s 1-75 we take advantage of their enormous banana split. There were 4 adults at our table plus one child (my daughter). We usually cannot finish this heavyweight dessert but this year we tackled the banana split and ate the whole entire thing! I felt like a pig afterward (oink oink) but I kept on using that spoon as a shovel to shove more and more ice-cream into my mouth. I deserved the little bellyache I had on the car ride home. Tony’s I-75 Banana Split For $10 you can feed the whole table dessert! Overall we were satisfied with our meals. We all left with full bellies and smiles on our face, that is for certain. We will continue with our yearly tradition for meeting up here once a year. For weeks leading up to it, we are always all talking about that banana split. That dessert is truly the highlight of the meal for me. This is a great restaurant for family dining and I think that everyone in the area should experience this place at least once in their lifetime. I am hopeful and optimistic that this Tony’s I-75 restaurant review will inspire you and your family to give it a whirl someday. It is most definitely worth the drive! 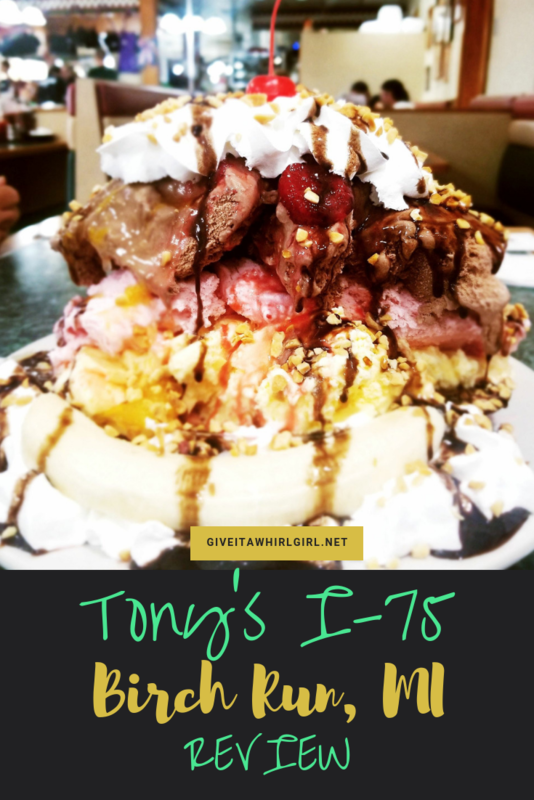 Have you ever been to Tony’s I-75? What do you enjoy ordering there? Leave me a comment and let me know what you like! If you have never been to Tony’s I-75 restaurant what appealed to you on their menu? Mon.-Thurs. : 6:30 a.m. – 9:30 p.m.
Fri. & Sat. : 6:30 a.m. – 11:00 p.m. This entry was posted in Local Spots I Visited and tagged antipasto, banana split, Birch Run, burrito, Chloe, family, family restaurant, food, ice cream, michigan, pizza, restaurant, restaurant review, salad, submarine, Tony's I-75. Bookmark the permalink. The Antipasto Salad looks Amazing!